Delicious baked sweet potato fries - pre-heat oven to 450 degree. 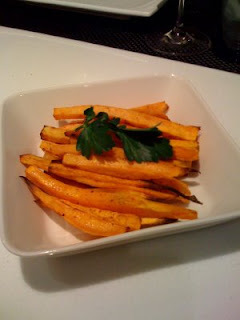 Peel and cut up the sweet potato into 1/4 inch long slices, toss in olive oil, and season with cayenne, salt, and pepper. Bake on parchment paper on a cookie sheet in the oven for 20 to 25 minutes. The cayenne adds a nice kick and balance to the sweetness of the potato. A New Business Opportunity in Williamsburg?